Doing our part for the environment is everyone’s responsibility. This is a truth embodied by Australia’s National Waste Policy, which was agreed and established in November 2009. The National Waste Policy outlines the country’s coherent and efficient approach to waste management. With a thrust of “less waste, more resources”, the National Waste Policy aims to direct policies and regulatory frameworks until 2020. The policy has several key target areas and strategies to cover the handling of wastes, including hazardous substances, and liquid, gas, and solid waste. It also involves the management of municipal, commercial, and industrial waste in this collaborative effort. Radioactive waste is excluded from the coverage of this policy. The National Waste Policy has led to the creation of a framework on the country’s waste management. It seeks to reduce the amount of waste generated, and provides ways to recover resources and manage waste efficiently. The policy is aligned with the country’s international obligations towards handling hazardous wastes and organic pollutants. Even more than that, it is consistent with Australian values when it comes to protecting future generations, finding ways towards sustainability in times of climate change, ensuring innovation and employment opportunities, and maintaining other interests of the state. The policy has several mechanisms. National companies and small businesses are covered by regulatory frameworks that govern over the handling of products and materials. The framework also aims to promote leadership in waste and resource recovery. All of these areas contribute to a better, more responsible Australia. To target these areas, different collaborative strategies are in place. Different strategies are in place to ensure that the goal of “less waste, more resources” is met. These actions come from different sectors of society, like the Australian government, the different states and territories, municipalities, and local jurisdictions. With a few years left until the marker year 2020, here are some of the efforts involved in waste and resource recovery. Under the National Waste Policy, the Australian government was set to create and implement frameworks and legislations involving emissions from landfills and other waste, as well as other large scale approaches. The different environmental programs of the country are designed to align with the National Waste Policy and with international obligations on environmental protection. There have also been collaborative efforts on market optimisation and material maximisation. These efforts are intended to reduce the demand for raw material mining and procurement by recycling existing materials within the markets. States and territories, as well as individual jurisdictions, are involved in sustaining these principles and practices which are protective of the environment. Down to the individual waste practices of offices and homes, these strategies improve waste avoidance and the re-use of materials. 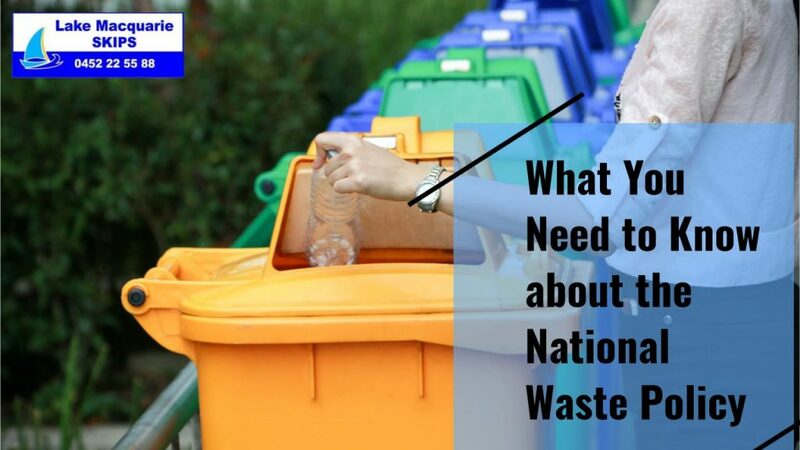 The growing awareness of the National Waste Policy and what it stands for is important. Within your household or office, there are ways to join in the collaborative approach towards sustainability and environmental protection. From renovation projects to the weekly rubbish in your skip bins, you have the power to also contribute to waste management. Responsible segregation of waste can make a difference. Working with a professional and reputable company can ensure that your waste goes to the proper disposal and management sites. For a professional team with regulated and insured services, trust in Lake Macquarie Skips. The delivery and pick-up service offers skip bins of different sizes, 2m3 to 10m3, to suit your needs, along with a highly efficient system. Contact Lake Macquarie Skips through the convenient online booking system or through 0452 22 55 88!